Construction of The Atlantic Dock - a massive, man-made harbor for deep water ships, began on June 3, 1841. The erection of stout stone warehouses and towering grain elevators that could handle products coming down the Erie Canal began in 1844 and four years later a line of warehouses was completed. 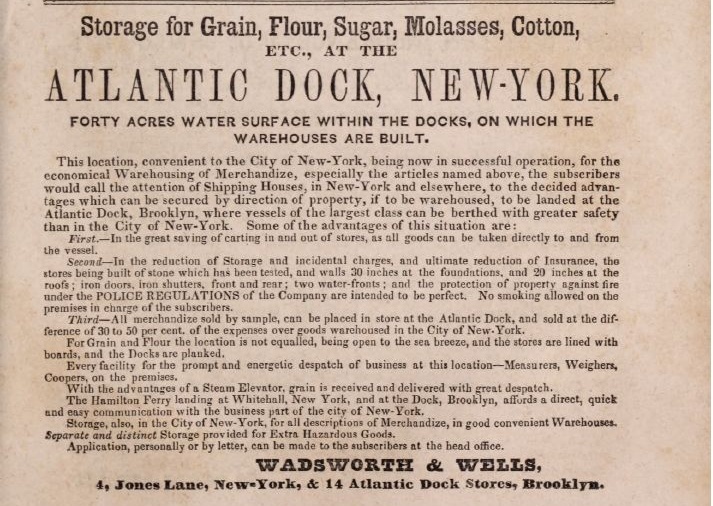 The vision of Atlantic Dock becoming a major hub of trade for grain, sugar, coffee and other goods was realized. Its success spurred further development including Red Hook's Erie Basin. Soon after it was built, the Atlantic Dock Basin was teaming with small canal boats, large ocean going vessels, and, to a lesser extent, pleasure yachts. It was also once home to passenger ships lines, notably, the point of arrival for the Puerto Rican community in New York in the first half of the 20th Century. Today Atlantic Dock, now called Atlantic Basin, is a much smaller, modernized remnant of the former grandeur of Atlantic Dock. Much of the basin has been filled in to form a parking lot for trucks and in the 1950s, long metal sheds replaced the stone warehouses. Atlantic Dock is a home for two MARYs. The QUEEN MARY 2, docks at the outside of the basin, and inside is PortSide NewYork's MARY A. WHALEN. 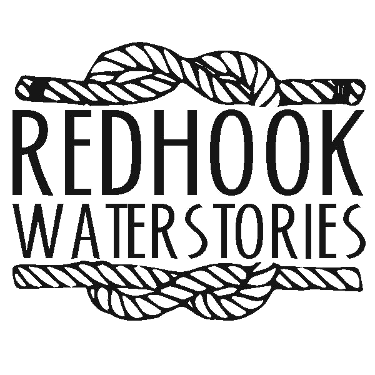 Click here for a curated tour through Red Hook WaterStories' collection about Atlantic Basin. For all items in RHWS related to Atlantic Basin, see "Subjects" and "Tags" or do a search. FORTY ACRES WATER SURFACE WITHIN THE DOCKS, ON WHICH THE WAREHOUSES ARE BUILT. First. — In the great saving of carting in and out of stores, as all goods can be taken directly to and from the vessel. Second—In the reduction of Storage and incidental charges, and ultimate reduction of Insurance, the stores being built of stone which has been tested, and walls 30 inches at the foundations, and 20 inches at the roofs ; iron doors, iron shutters, front and rear ; two water-fronts ; and the protection of property against fire under the POLICE REGULATIONS of the Company are intended to be perfect. No smoking allowed on the premises in charge of the subscribers. Third —All merchandise sold by sample, can be placed in store at the Atlantic Dock, and sold at the difference of 30 to 50 per cent, of the expenses over goods warehoused in the City of New- York. For Grain and Flour the location is not equaled, being open to the sea breeze, and the stores are lined with boards, and the Docks are planked. Every facility for the prompt and energetic dispatch of business at this location —Measurers, Weighers, Coopers, "on the premises. With the advantages of a Steam Elevator, grain is received and delivered with great dispatch. The Hamilton Ferry landing at Whitehall, New York, and at the Dock, Brooklyn, affords a direct, quick and easy communication with the business art of the city of New-York. Storage, also, in the City of New- York, for all descriptions of Merchandise, in good convenient Warehouses, Separate and distinct Storage provided for Extra Hazardous Goods. Application, personally or by letter, can be made to the subscribers at the head office. This Item is related to Item: Atlantic Dock Brooklyn: Important improvement at Brooklyn, 1848.